Are Your Products Officially Licensed? Licensing. It's actually pretty important if you truly consider yourself a fan of this medium. Sure, you might be able to find some crudely made knock-off shirt that some random dude made in their garage on the cheap but come on! What about the guys who poured all of their blood, sweat, and tears into forging characters that you love and appreciate? Do you want them to see their own creations on stuff they had no idea existed without getting a cut? Exactly! You don't wanna be that guy...or maybe you do and you're a jerk. If that's the case you may wanna get a hold of the Jerk Store. They are fresh out of you! All of our official products are licensed; those Batman symbols you see? All official DC. Superman? You know it. Aquaman? Cyborg? Flash? The whole bloody lot of DC and all of those comic images! What about Captain America? Iron Man? Hulk? Doctor Strange? Spider-Man? Avengers? Yep! You'll see the official 'Marvel' tag on all of those as well. 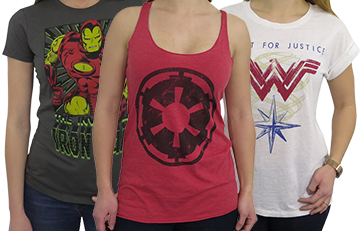 You'll even see the 'Disney' symbol on all of our Star Wars stuff...which is still kinda weird to write but hey, whatever! The Force is apparently quite strong with The Mouse. With officially licensed products, you know that everybody involved has been duly compensated which helps to further invest and develop the industry. 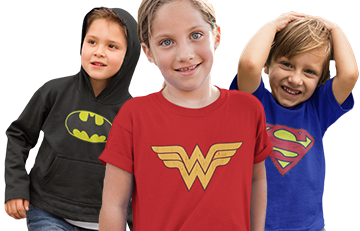 We all love our shirts, pint glasses, lunchboxes, plushies, figures, POP Funs, beanies, sweaters, and whatever else we can scare up and the only we we can keep that up is through the magic of licensing. 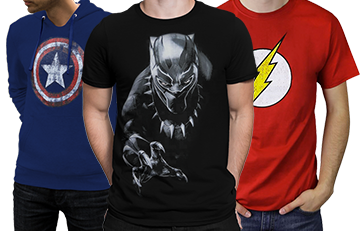 We work with our manufacturers who in-turn work with companies like Disney, Marvel, and DC and that's how we are able to bring such wonderful things to you. You see all of our wonderful New Era exclusives? Those took a lot of work...you can't make those things in a still in backwater Appalachia, ya know? We know you people love comics. We know that you know that we also love comics. We like to keep everything on the up-and-up here at SuperHeroStuff so you know that everything you'll be getting is officially licensed and of the best quality. Besides that's way too ironic to rip off superheroes...that's like, completely missing the point isn't it?